Simple lines, industrial materials, brilliant use of color, and impeccable craftsmanship by some of the best furniture designers to ever live are just a few compelling reasons why midcentury modern design inspires so many. If you are one of those people ready to make your 1950s bathroom remodel dreams come true, then you've come to the right place. 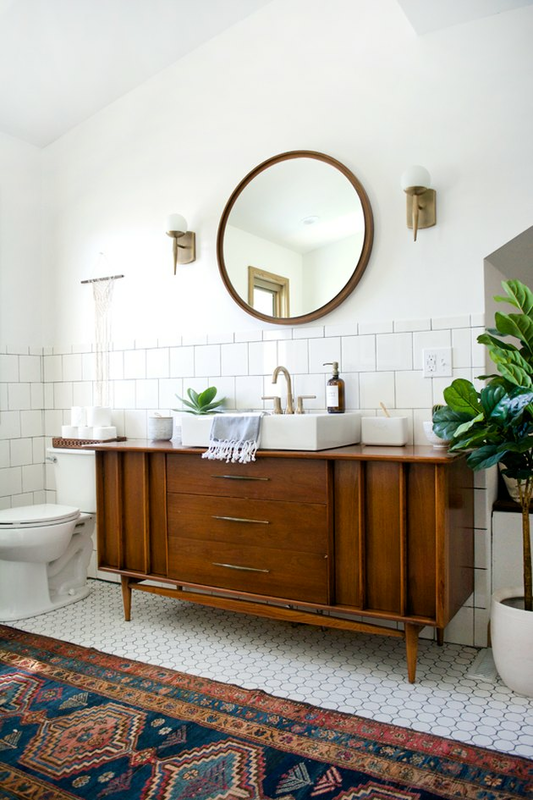 Here, 12 ways to incorporate a little bit of that vintage, retro magic into your bathroom design. 1. Atomic starbursts are a must. You can't think of midcentury modern design without conjuring images of the iconic atomic starburst. Due to its popularity, it didn't take long before lighting designers began adopting this asymmetrical shape for flush mounts, chandeliers, and pendants. 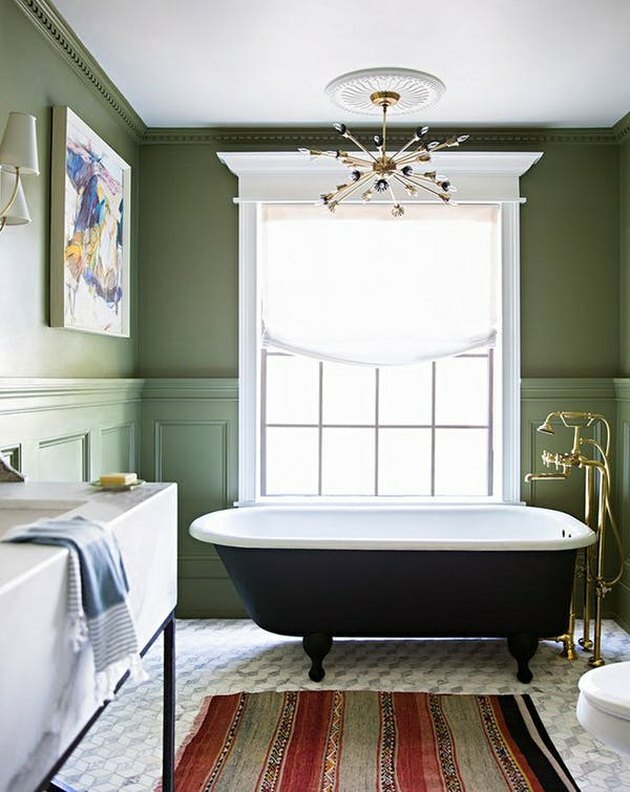 Jenny Komenda from the blog the Little Green Notebook opted for a stunning chandelier above her vintage clawfoot tub for a little retro glam. 2. Don't be afraid to use bold colors. Many midcentury designs feature a pop of color every now and then. Although there are a few color palettes typical of the design era, cooler hues allow designers to have some fun. 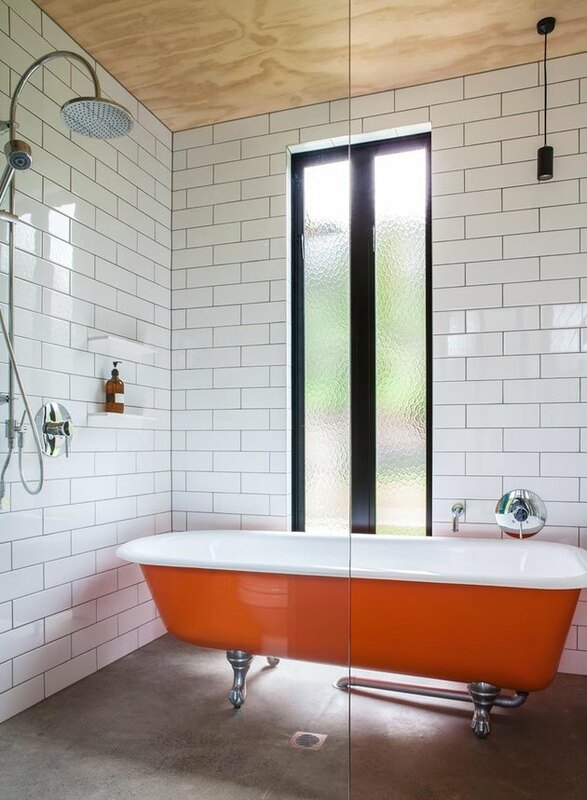 The white subway tile in this bathroom acts as a neutral backdrop against the bright orange clawfoot bathtub. 3. Wood furniture should play a starring role. 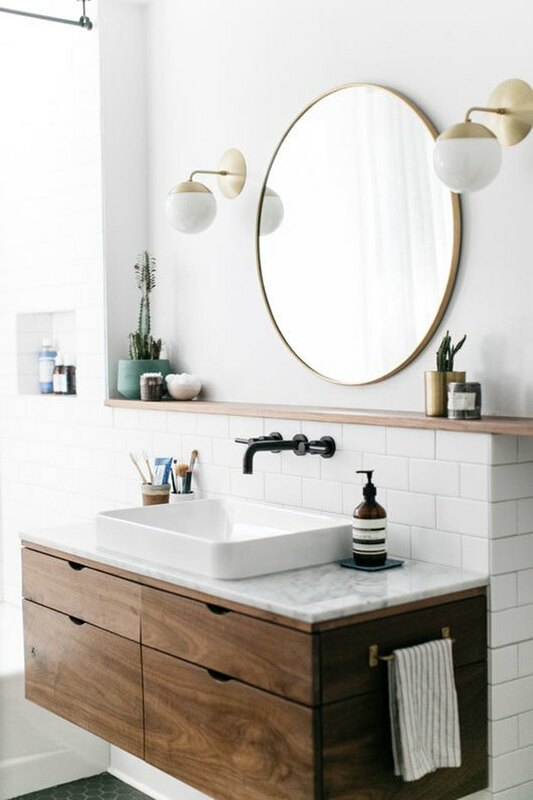 Wood vanity cabinets present the perfect opportunity for you to incorporate a midcentury vibe into your bathroom. 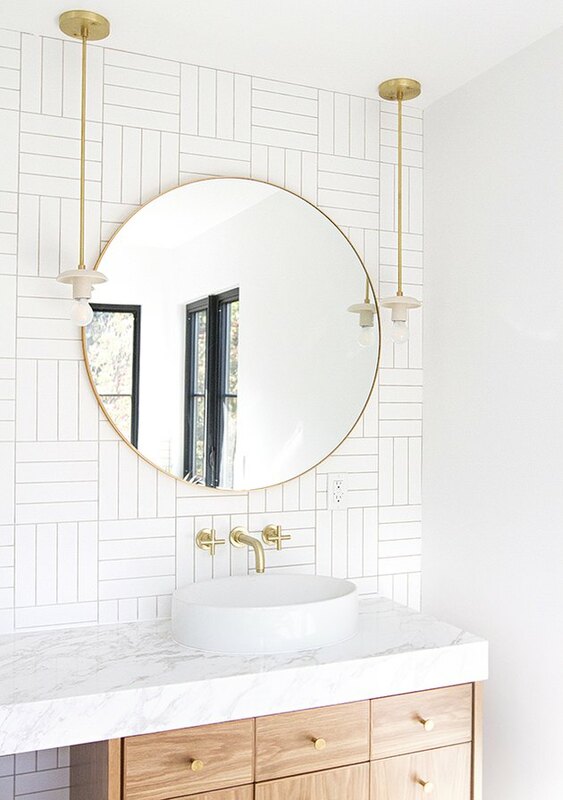 Look for options that feature simple lines, tapered legs, and minimal ornamentation like this vintage vanity that Bre from the blog Brepurposed was lucky enough to find on Craigslist. 4. Opt for minimalist designs. Minimal ornamentation, quality materials, and unique shapes are all hallmarks of midcentury design. 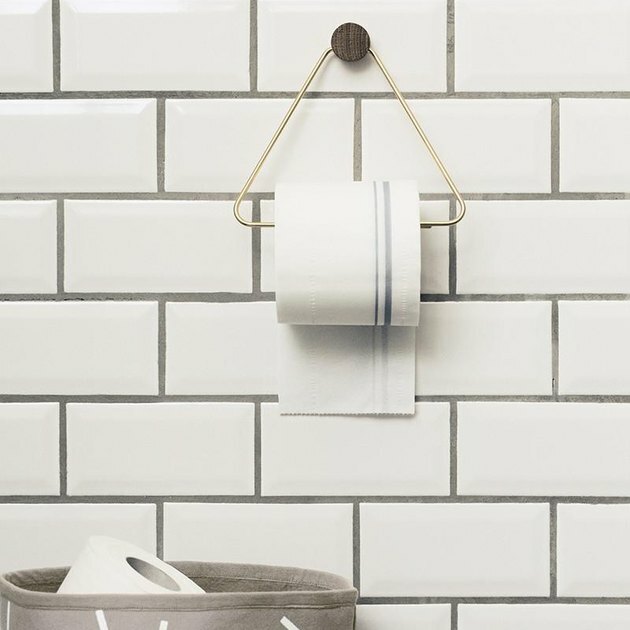 Bathroom fixtures like this toilet paper holder from Ferm Living are a perfect match. Midcentury design introduced a bevy of curvy, asymmetrical shapes that are commonly associated with the design era. In typical bold fashion, designer Kelly Wearstler shows us how this design trend is done right. 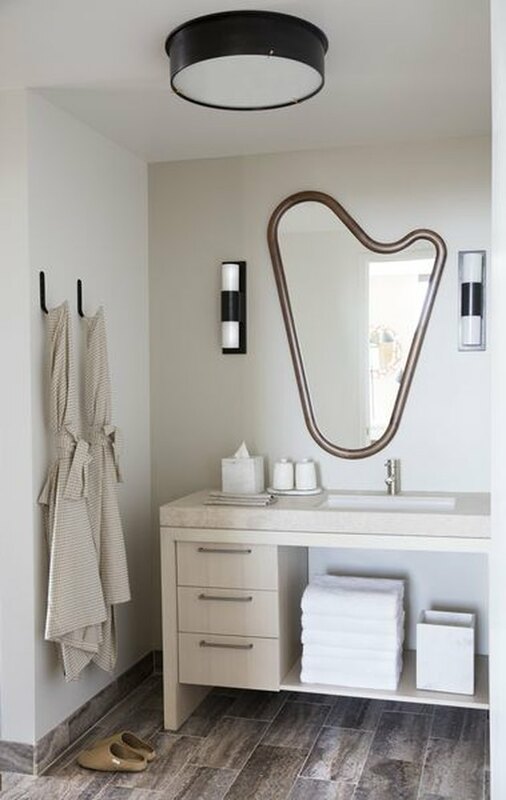 She selected a gorgeous vanity mirror with an organic silhouette for the soon-to-be-opened Downtown Proper hotel's guest baths. 6. Look for simple lines, even in pendant lights. Simple lines and the use of honest materials are hallmarks of midcentury design, as well as these mini pendant lights designed by Sarah Sherman Samuel for Cedar & Moss. 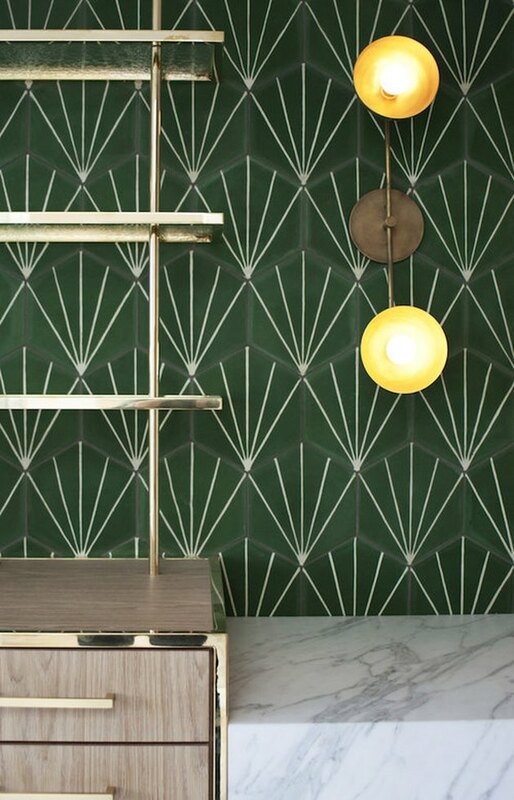 While design movements preceding the midcentury modernism era emphasized inordinately decorative elements, modernist design brought the design world simplicity, and we just can't get enough. Much as it is today, the use of industrial materials such as glass, concrete, steel, and brass were used quite frequently during the midcentury design era. 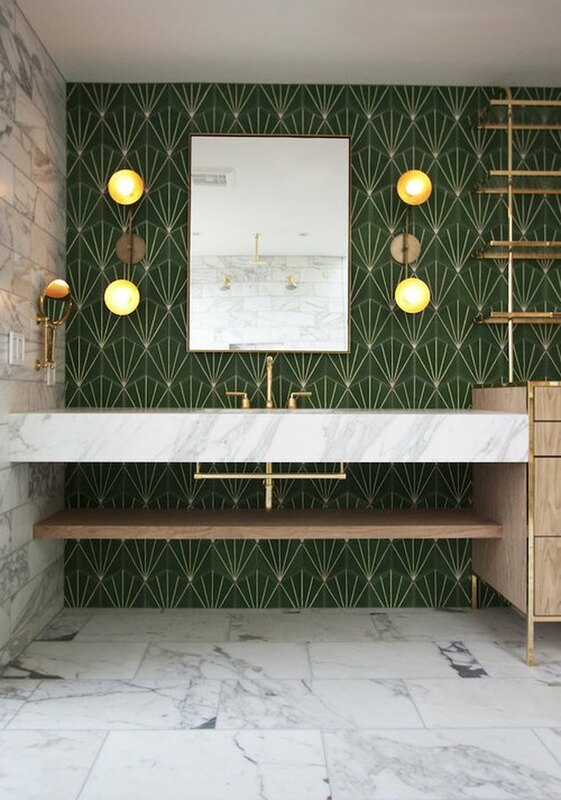 Bright Design Lab beautifully incorporated gorgeous brass detailing throughout this entire modern bath. The end result a sophisticated washroom sure to meet the approval of Mad Men's Don Draper. 8. Add playful pop art accents. The Pop Art movement was on the rise at the same time that midcentury modern design became an established style. 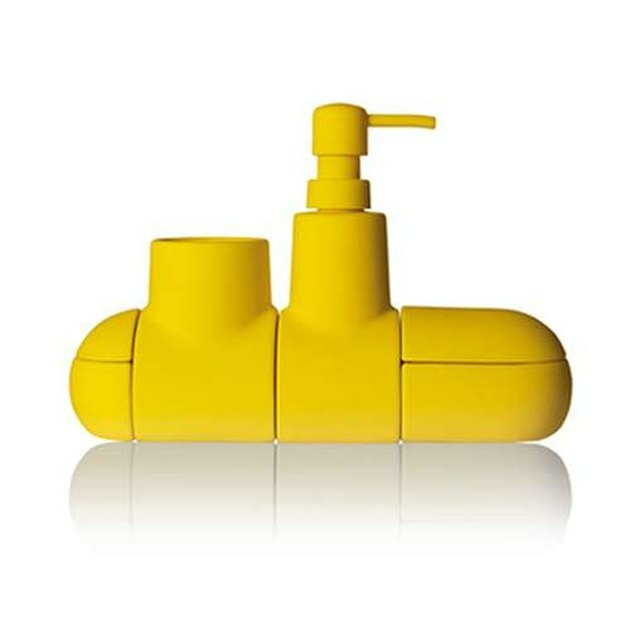 This pop art-inspired bathroom accessory set from Seletti is a whimsical way to pay homage to the artists of the time, while adding a small pop of color. 9. Not all wall sconces are created equal. Antique light fixtures, while beautiful, are not the most sustainable options on the market. Not to worry, you can still enjoy the vintage look you adore while still being a friend to the environment. We just love these brass wall sconces with hand-blown glass shades from Cedar & Moss that will blend effortlessly into your midcentury inspired bath. 10. Teak accents are essential. Trade in your fuzzy bath rug for a simple yet elegant bath mat made of teak. Crate & Barrel has a lovely option, and bonus — it's eco-friendly, as well. 11. Mix and match simple patterns. Opting to combine patterns can be tricky, but the end result is worth the struggle to get it right. 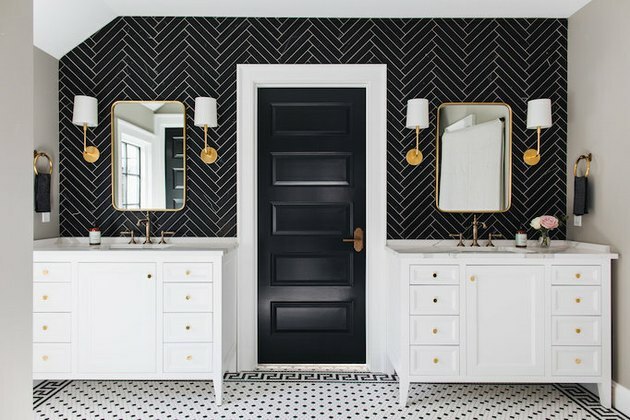 Half the battle is finding a perfect patterned backdrop that will work well with other patterns without making your bathroom design feel too busy or hectic. 12. Emphasize nature with stylish ceramics. From pre-millennial powder pink toilet paper holders to biomorphic toothpaste holders, ceramics were everywhere during the mid 20th century. Not only do they make stylish accessories, but ceramic planters are also a cost effective way to bring a little bit of the outdoors indoors, which was a key element of midcentury modern design. 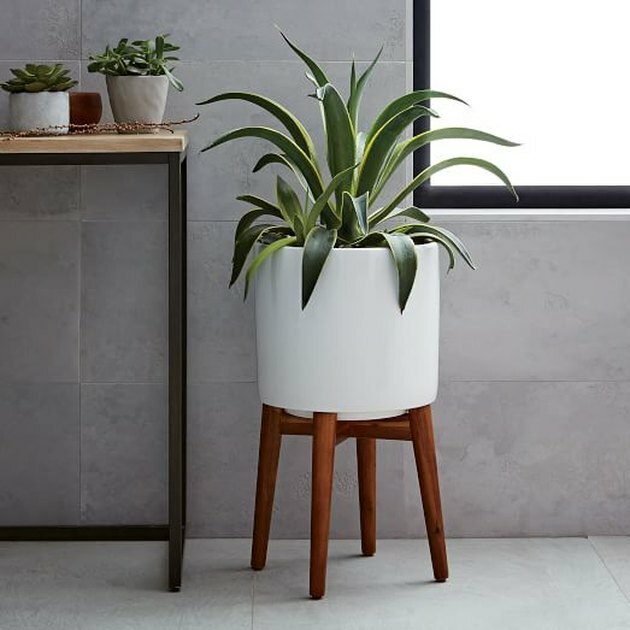 This handsome standing planter from West Elm is an ideal option for the bathroom. Pro tip: Opt for plants that will thrive in a humid environment.